A set of Butterfly cards! I have couple of cards to share with you. I placed my very first order with Concord and 9th couple of weeks ago. I have been looking at their designs for a while now and love their innovative approach to stamps and dies. 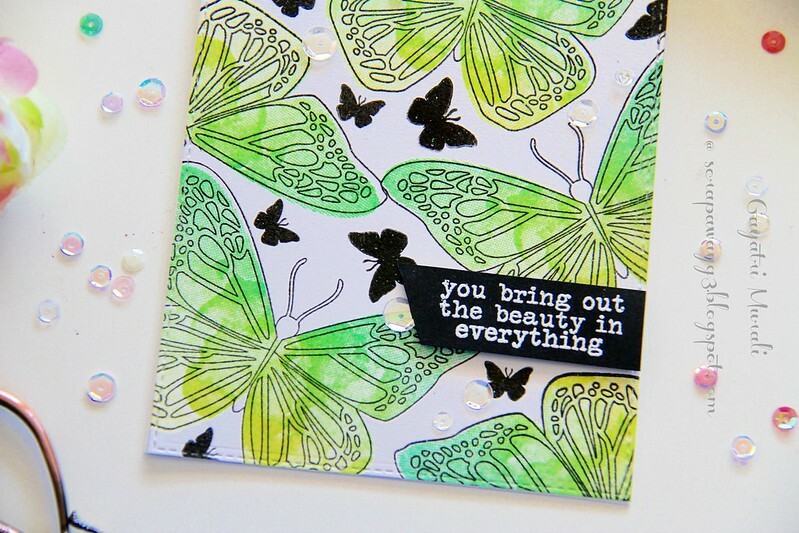 This release I could not resist the Butterfly Beauty stamp set and the Say Hello stamp set and dies. So the sets came home yesterday. I inked them up this morning and had fun making these two cards. Lord, I love that watercolour butterfly image. So beautiful when stamped with ink. The image gives you the watercolour look to the butterfly and texture as well. I had so much fun inking up the stamp with lots of colours. But the Hero Arts Neon Ombre Green to Blue was my favourite of all. 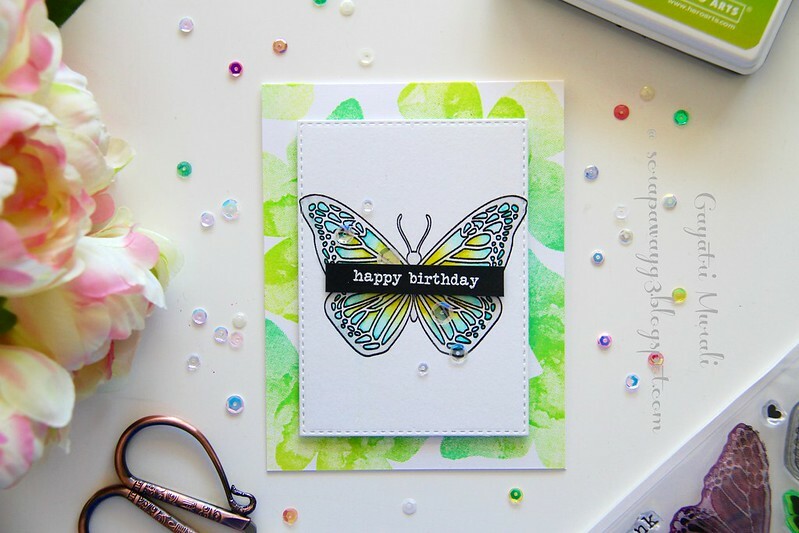 Both my cards today feature Hero Arts Neon Green to Blue ink with the Butterfly Beauty stamp set. Here is the first card. 1. 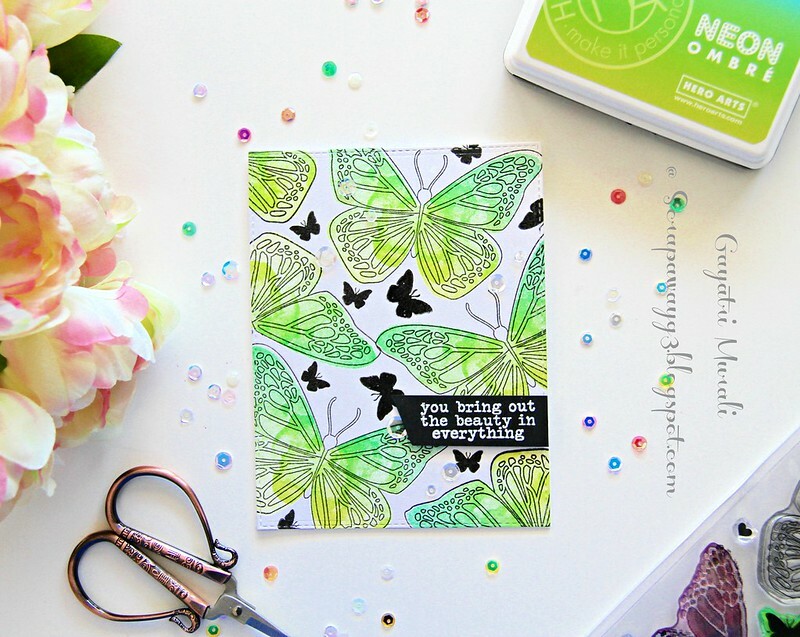 I stamped the watercolour background butterfly stamp using the HA Neon Ombre ink randomly on a white card stock panel covering the entire panel. 2. Then I stamped the outline butterfly image using Versafine Onyx Black ink over the background images and heat embossed them all. 3. Then I used the smaller solid butterflies from the stamp set to stamp in black ink and heat embossed the images as well. 4. The sentiment is white heat embossed on a strip of black cardstock and adhered to the panel. 5. The panel is adhered to the white card base and embellished with sequins from Pretty Pink Posh. I love the bright neon green and blues colours, texture from the stamp and watercolour effect on the card. The background butterfly stamp is like a jackpot. Its got everything without having to put any effort. 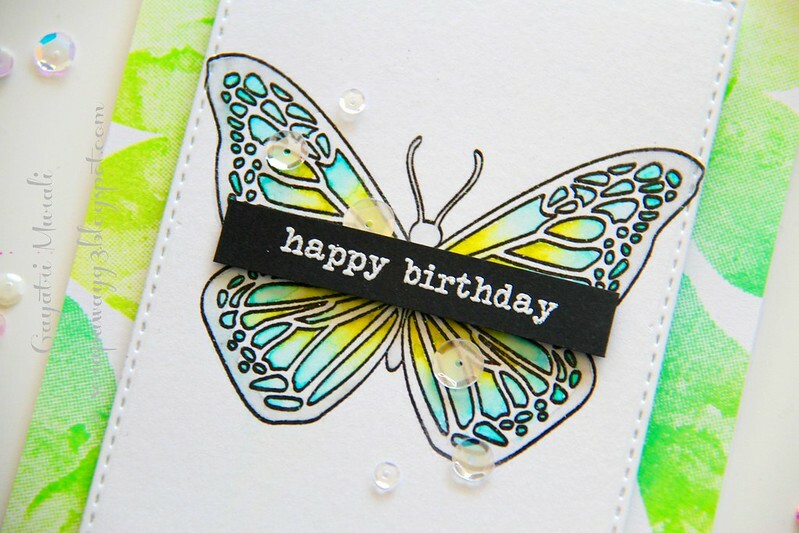 For my second card, I used this background butterfly stamp for the background of the card and the outline image as the focal point. 1. 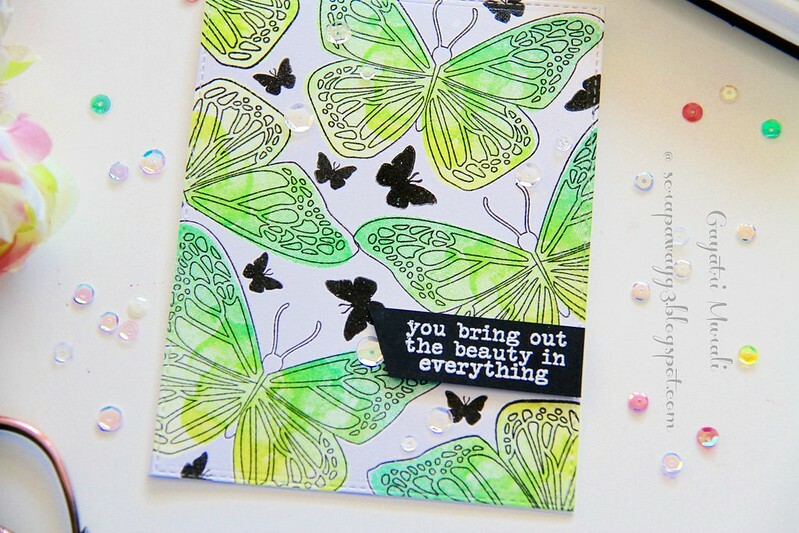 On the card front, I stamped the background butterfly image using the HA neon ombre ink. 2. On a watercolour paper, I black heat embossed the outline butterfly image and watercoloured using blue, green and grey Zig clean colour pens. 3. I die cut the watercolour panel using the second largest stitched rectangle die from Simon Says Stamp. 5. 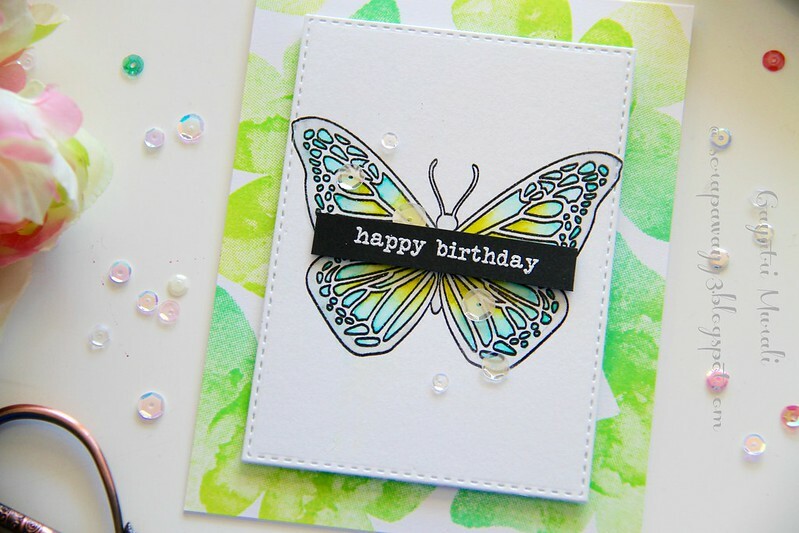 The sentiment is white heat embossed on a strip of black cardstock, trimmed and adhered on the centre of the focal butterfly using foam adhesives. 6. Finally embellished with a few Sparkly Clear sequins from Pretty Pink Posh. As always couple of closeups of the card. I really love Concord and 9th designs. I know a lot of designers love the company. But I had to see it myself. It took me long to make an order with them and play with their design. I am glad I did. I have the dies and another bundle to play with over the weekend. Another favourite stamp company to my list. These are beautiful – just love the crisp citrus colours!